As we begin putting the garden to bed, I would like to focus on two strategies that will help ensure your success for the following year and subsequent seasons. I like to call it “gardening with the next season in mind.” Although the concept of crop rotation applies mostly to vegetable gardens, this same idea could be applied to flower gardens as well. Certainly garden sanitation applies to all of us who have had pest and disease problems at any time throughout the year. 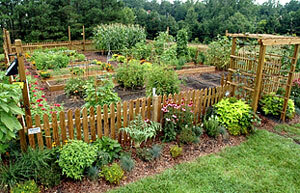 From season to season, move crops of the same family to a different location within the garden. There are many pests and diseases that lurk in the soil, constantly working to build up populations from year to year. Once they find a preferred food source or host, they will take up residence and stay indefinitely. The food sources I’m speaking of are seemingly different plants that all happen to be in the same family. For example, tomatoes, peppers, eggplants and potatoes are members of the nightshade family. These plants will attract the same pests and diseases. If a certain soil borne disease or pest finds your tomato plants particularly attractive, they’ll stick around as long as there is available sustenance. That may come the next season when you again plant tomatoes in the same spot, or they may persist because you planted peppers, eggplant, or potatoes. Until you break the cycle, by planting resistant varieties and/or unrelated crops of different families (a.k.a. rotating crops), you may be unable to eliminate the recurring problem residing in the soil. The best way to accomplish this is to remove their food source completely for several seasons. This will either drive the offending pests away because their food preference is gone, or kill off the pests and diseases that are dependant on that crop for survival. After several seasons (and the more the better but four is great) it is perfectly fine to replant the original crop such as tomatoes in the same spot as before. The presumption is that whatever problem was occurring in the soil has long since been driven out assuming no other crops of the same family have been planted in its place in subsequent seasons. Another way to reduce problems in any garden is to practice good sanitation. Weeds, rotting leaves of plants affected by diseases and the diseased plants themselves as well as the surrounding mulch should be removed from your garden. This debris should be destroyed, not composted. Diseases and pests will be attracted to and over winter in your garden just about anywhere they can find some shelter and a little protection from the elements. Because weeds and rotting leaves are some of their favorite places for this, many problems that surface next spring and summer can be greatly reduced by eliminating their shelter now. But, unlike mulch around diseased plants, mulch around healthy plants can be turned back into the soil to decompose and improve organic content. Good sanitation practices include vigilance in weeding and removal of disease infected leaves and other plant material. A clean garden is a healthy garden. The more you can do to keep it that way, not only during the season, but especially in between them will give you the best possible start coming into each new gardening year. I have just seen my first show, and it interested me as am fairly new to correct gardening prep for soul, and in fact grew my first of fall gardening, as new home just purchased has a raised boxed garden area. Now that I have a garden at my actual home, usually on borrowed spots of others land, I can give more attention to and want to learn what I can to protect and it make it the best it can be. Planted some things, that I have never had a pest problem with in open areas of others as before, as I did in this new area. Really concerned that I will be fighting these pests more now, in this area. Hope I can find all I need via your show and/or website to solve my every season and day needs for my gardening. Then just need to really learn to can also, soon!! Great show. I really like it because it focuses on edibles . . . ways to feed our families. Keep up the good work. I’ll keep watching. Thanks Miriam. We love comments like this. And we will keep the shows coming.